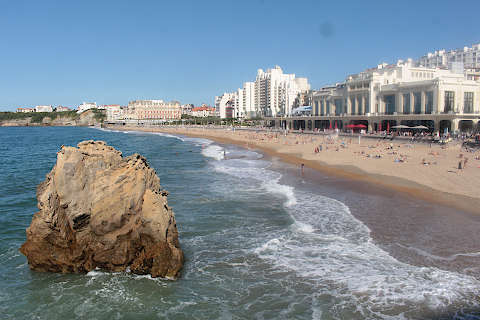 Biarritz is a popular and lively resort on the Atlantic coast in south-west France (in the Pyrénées-Atlantique department of Aquitaine). 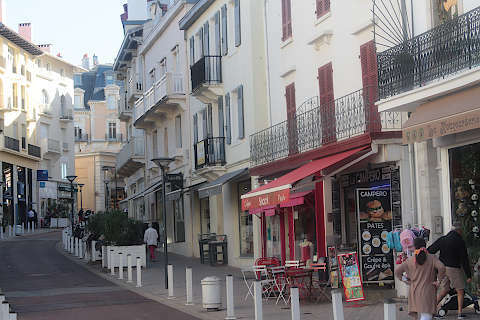 The town has a great deal of charm and is much loved by visitors because of the town, the beach and coast, and its reputation as surfing capital of France. France This Way comment: as you will quickly realise, we are very enthusiastic about Biarritz and would recommend that if you are visiting the coast of south-west France you stay either here in Biarritz or as an alternative further north in Arcachon, another of our favourite resort towns. Even better, stay a few days in each of them! 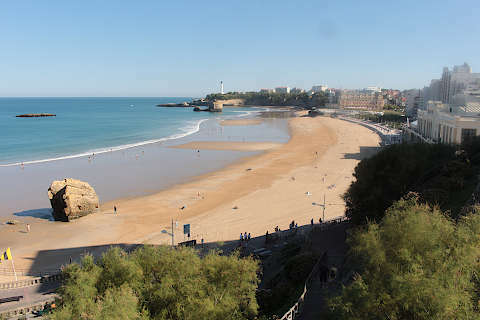 Almost any visit to Biarritz will start on or near the beach. 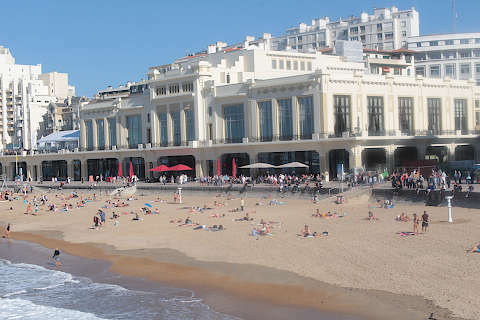 The Grande Plage in the centre of the town is superb and provides much of the appeal of Biarritz. The northern half of this beach is called Plage Miramar. 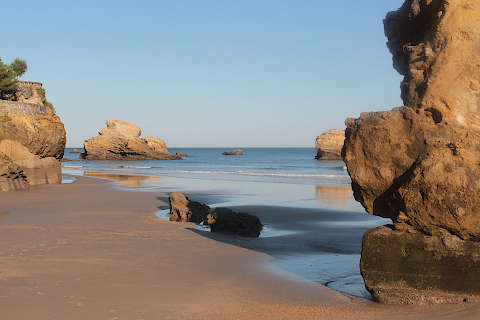 It is a long sandy beach with a lighthouse on a rocky outcrop, Point St Martin, at one end and Pointe Atalaye and the Rocher de la Vierge at the other and a few well situated large rocks in the ocean to add to the interest and beauty of the scene. 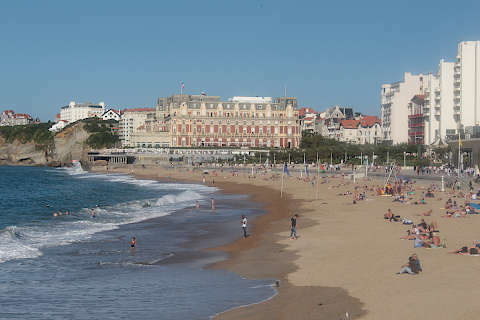 The Grande Plage has areas for swimming and separate areas for surfing. 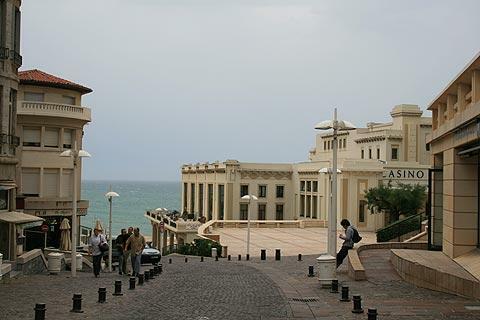 The Art Deco style casino is in a central position on the beach and is a perfect spot to sit on the terrace, sip a glass of wine or have lunch and watch the waves breaking onto the beach. It’s not too expensive either given its lovely position. 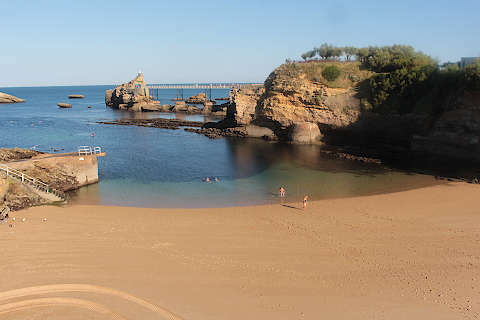 In fact there are several beaches in Biarritz, including a small beach to the south of the town centre in the Port Vieux, much loved by swimmers. Until the 1850s this was the beach where whales were brought ashore to be cut up and sold! A little further, the other side of the Pointe Atalaye headland and the port, you will find the Plage de la Cote des Basques. 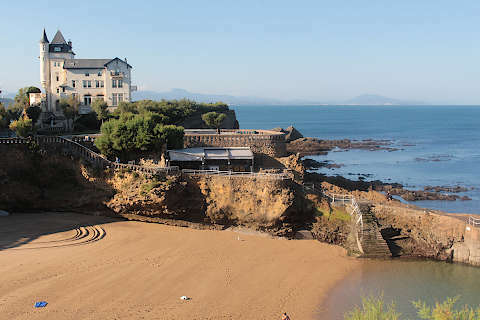 The backdrop to this beach is less beautiful with more modern apartment blocks but it is a very long sandy beach and to the south you can see the mountains of the Pyrenees. 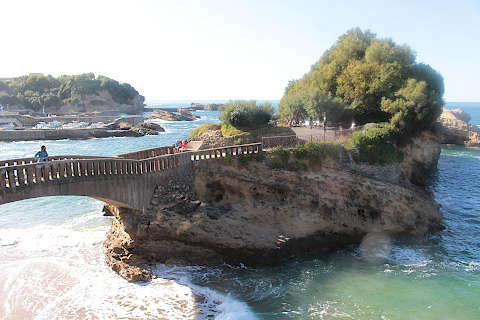 The coast path in Biarritz goes all the way from the lighthouse on the headland to the north, behind the Grande Plage, passed the Port de Pecheurs, Pointe Atalaye and the Rock of the Virgin and on to the Plage de la Cote des Basques. This walk is one I would be happy to do every day of my life. 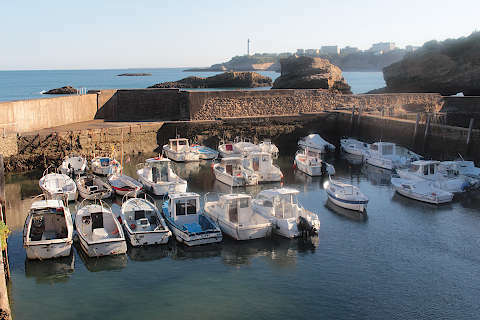 The views of Biarritz from the lighthouse are exceptional, and around Pointe Atalaye there are lots of little coves and walkways to some of the rocks including the Rocher de la Vierge with the statue of the Virgin, which has become the symbol of Biarritz. 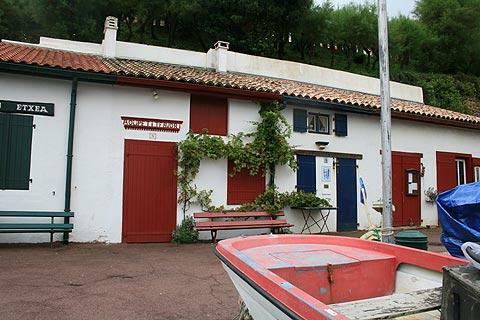 Down below is the Port des Pecheurs with a few lovely little fishing cottages – now restaurants which are great for sea-food, dishes with a Basque influence and tapas. They overlook the tiny little walled marina, home to a few smallish boats and yachts. The rocks are covered in lots of vegetation whose colours blend beautifully with the blues and greens of the sea. Down the slopes from the town to the sea yuccas and agaves grow happily amongst beautiful lush hydrangeas – a combination unlikely to be found in many places as hydrangeas need water and agaves don’t! 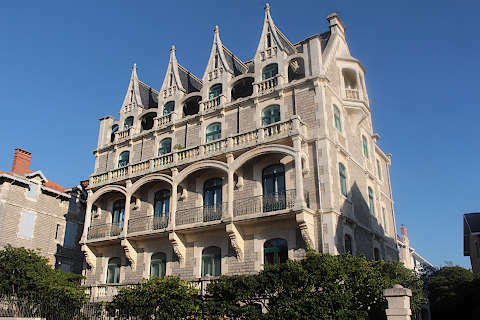 Although the focus of the town is definitely seaward, Biarritz has various highlights to discover in the town itself including numerous grand hotels and villas that you will see throughout the town, often overlooking the sea. 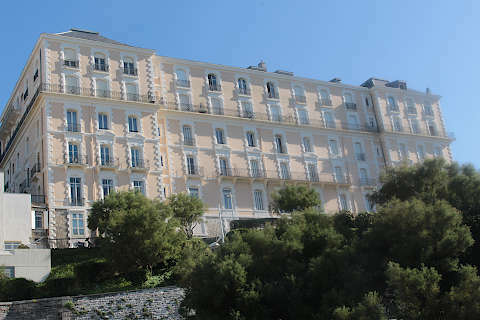 Above the Plage Miramar and the Pointe St Martin you can see the very impressive Hotel du Palais which was the Villa Eugenie built by Napoleon III for Eugenie who he met in Biarritz. One of our favourite places is the small Place Bellevue from where you have one of the best views across the town centre and Grande Plage. 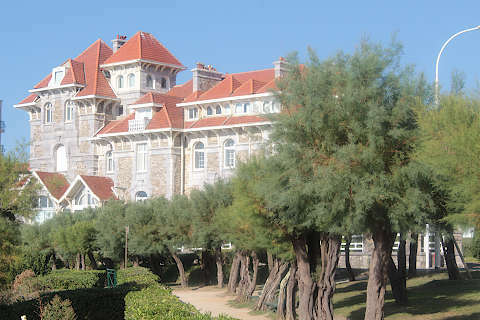 The Bellevue building next to the square is an imposing exmple of the Belle Epoque style, and a statue by Oteiza overlooks the view. Just west of here the cathedral church of St Eugenie is a bit somber but the Place Saint-Eugenie next to the church is a nice spot to sit and relax. 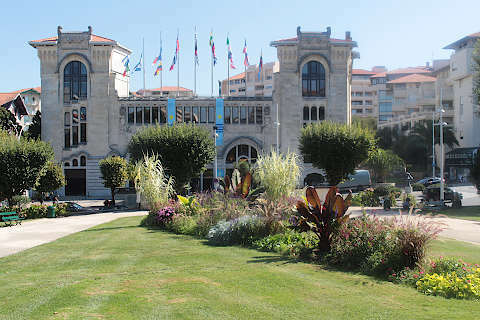 In recent years part of the city centre has become pedestrianised, helping relieve some of the congestion you might have experienced if you last visited Biarritz several years ago. The town has lots of nice shops and is very pleasant to stroll around. The market halls are a centre of ativity and open every morning, and to the east of here you can see the Gare du Midi, once a train station and now a congress centre. Among the other places of interest you will come across are several museums, dedicated to such varied subjects as chocolate, asian art and the ocean. The last will be the most fun with children, especially the visits to the Aquarium and the Cité de l'Océan. 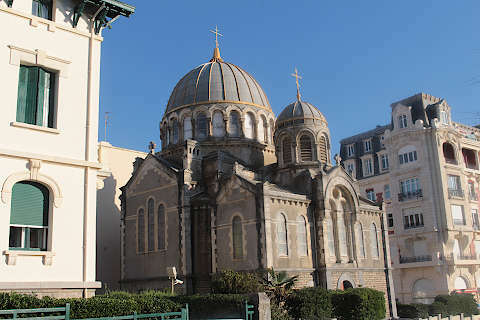 There are also smaller churches of some interest such as the Russian Orthodox domed church, built in the neo-Byzantine style in 1891 for the Russian community in Biarritz. 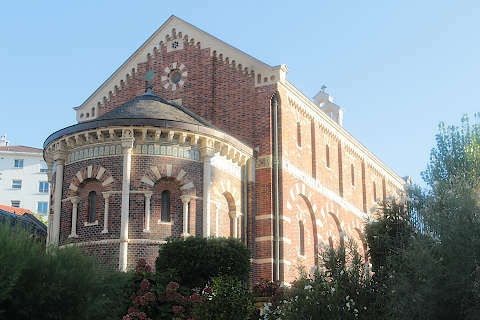 Another is the Imperial Chapel built in 1864 for Empress Eugenia in a Moorish-Byzantine style and deicated to the Mexican black virgin, Notre Dame de Guadelope. 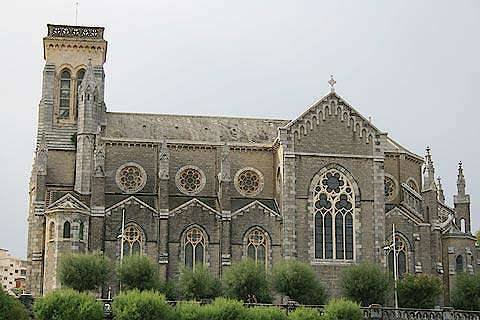 These churches are quite close together and behind the Hotel du Palais. Many visitors come to Biarritz for the surfing because of the good wave conditions along this part of the Atlantic. 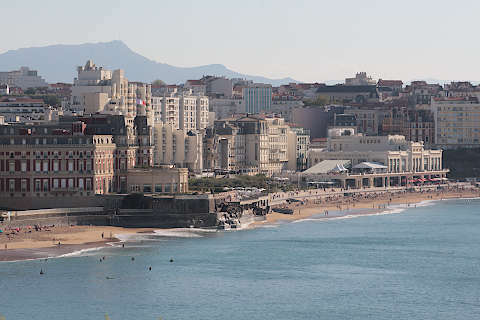 Various surfing competitions and events are also held that contribute further to the town's surf reputation, such as the annual Biarritz Surf Festival. 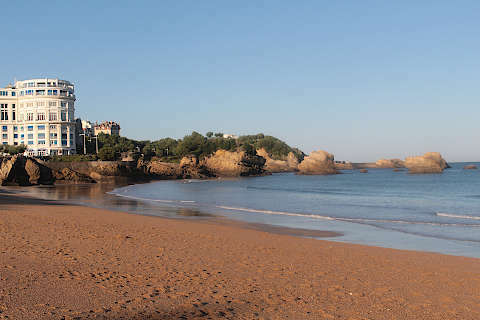 Note that not all Biarritz beaches allow surfing, some because of the undercurrents and others because of crowds and the risk of injury. If you have never surfed but would like to give it a try, there are training schools that will help you get started. The main surfing beaches are found at Anglet just beyond Pointe St Martin. 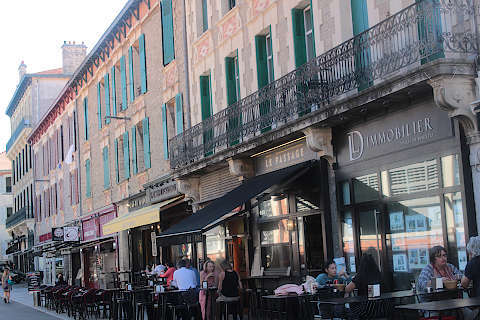 You should also take the time to walk along the riverfront and explore the town and historic centre of nearby Bayonne during your visit. 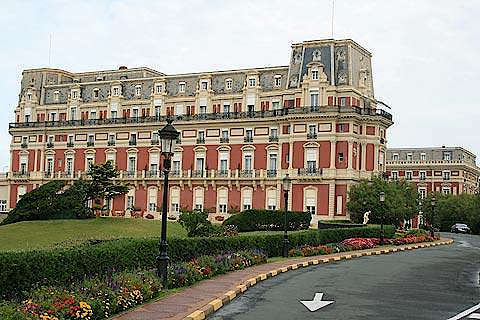 Biarritz is well known as the golf capital of France, and there are several very highly regarded golf courses to choose from in the vicinity.